As our May 2019 explorASIAN festival is quickly approaching, we are still followed by the great memories from our prior year‘s programming and Gala. We are proud of our past achievements and we are working hard to deliver another successful Vancouver Asian Heritage Month Festival this year. In 2018, we provided our members, sponsors, partner organizations, and volunteers with networking, learning, and engaging opportunities to showcase our Pan-Asian communities. 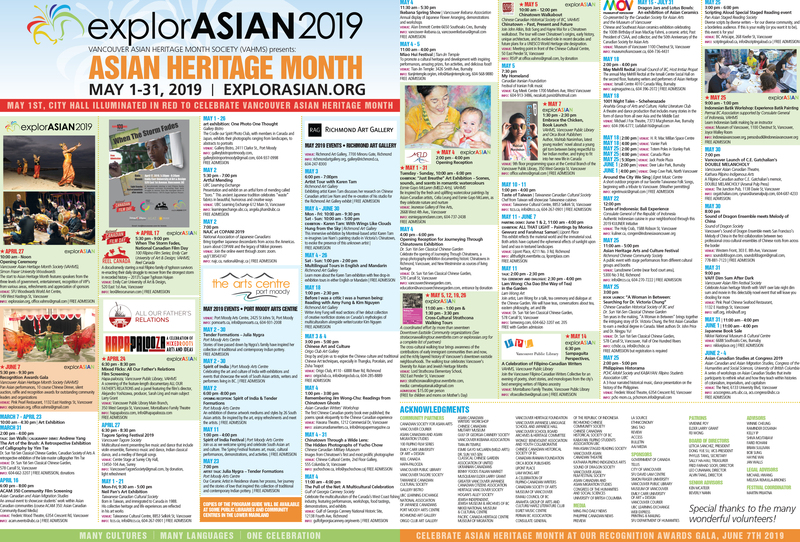 Our explorASIAN program included more than 40 events happening around the city. This year, our team goals and projects are focused on our vision of recognizing the participation of the Pan-Asian communities as an integral part of Canadian society and celebrating the hybridization of all arts and culture in Canada. We want to continue the tradition of excellence and enthusiasm that all members and friends of VAHMS have given to the explorASIAN festival in the past 23 years. Finally, I want to thank our new coordinator, advisors, board of directors, and volunteers for dedicating their time and expertise to fulfill our 2019 promises.